Exeter’s American Independence Festival is an annual celebration of our freedom and the founding of our nation. Enjoy a day of living history, with the arrival and reading of the Declaration of Independence, period crafts, music, dance, games, food and more. Join the crowd escorting George Washington down Water Street, see the horseback delivery of the Declaration and listen to the public reading (complete with hecklers! 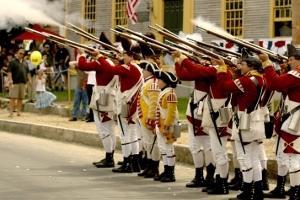 ), chat with historic role-players, step to the stirring music of the Lincoln Fife and Drum and delight in the maneuvers and cannon firings of militias. Visit the Traditional New Hampshire artisans’ village, view the original Dunlap Broadside (one of 26 known copies in the world) and early drafts of the U.S. Constitution and stroll Swasey Parkway and Water Street to see local arts and crafts. Enjoy plenty of food, music, sidewalk sales and children’s activities, then stay for the town’s evening fireworks and live band!